…that is, until Dr. Willard convinces her to start talking. In flashback land, the viewer learns that Louise was once in love with an engineer named David Sutton (Van Heflin) who didn’t exactly return her affection. Beginning to feel that she’s stifling him, he ends the relationship. During the same time Louise had been working as a caretaker for a depressed woman, the wife of Dean Graham (Raymond Massey). When Mrs. Graham passes away in what appears to be an accident, Dean asks Louise to marry him. Louise goes through with the marriage, but she’s still in love with David, and when he re-enters her life unexpectedly things take a turn for the worse. Curtis Bernhardt directs 1947’s Possessed. Spoiler alert: This is my new favorite Joan Crawford film! A better actress could not have been chosen to suit the character of Louise. 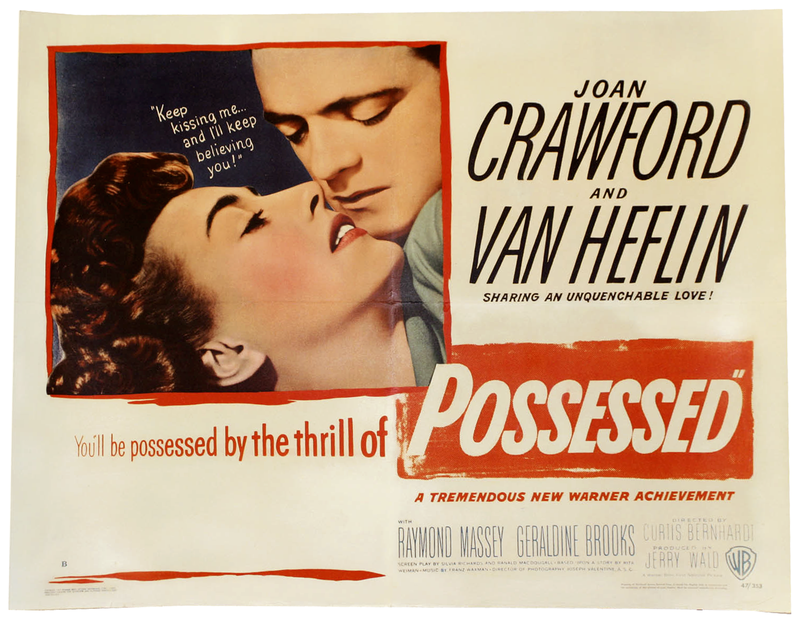 Crawford is the perfect lead for this film and gives one of her greatest performances here. Louise makes a striking transformation from pure adoration of David to desperation to revenge and mania. Joan pulls off every facet of the character without a hitch. She even succeeds in giving Louise a vulnerability that makes the audience sympathize with her despite her many faults. Just as striking as Joan’s performance is the film’s structure. I’m a total sucker for films told through flashbacks, and the use of them here is perfect. The structure is matched by gorgeous lighting, art direction and interesting shot sequences. And it’s impossible to talk about this film without talking about the man at the center of it all: David. Van Heflin gives a very impressive performance. He’s charming but brutally honest, always willing to put the feelings of others aside in favor of his own wants and motivations. 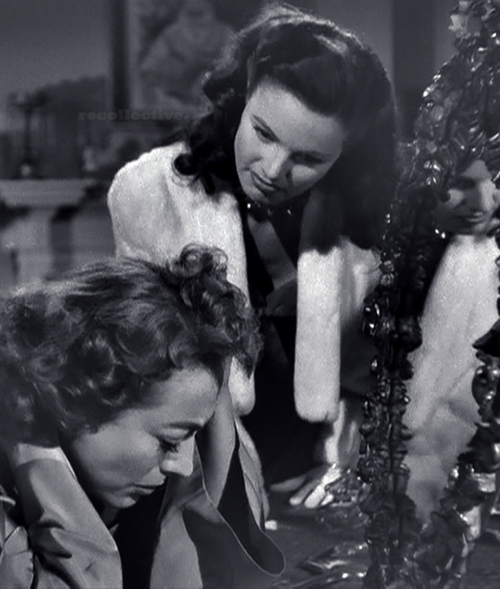 The character’s behavior justifies the anger of Joan’s character (though it doesn’t justify all of her actions!) and Heflin’s performance adds to that sense of smarmy-ness. These many wonderful elements make for a highly thrilling watch from the very beginning. There is great tension, a somewhat creepy mood, a sense of mystery. There’s some straight drama at play, too, as the viewer begins to gain a full picture of what happened. The film loses the slightest bit of steam in the middle portion, with tension and engrossment taking a small dive, but the recovery is quick and effective. Another cool review, Lindsey! I’d thought I’d seen this years ago, but the story sounds new to me, so I’ll have to re-visit the film soon. I think it’s in my ‘taped off TCM’ collection; if not, I’m sure Netflix Streaming has it, right? (sarcasm alert!) I love that line under the title in the poster: ‘A tremendous new Warner achievement’ (the studio said, patting itself on the back…). Thanks for the info! Years ago I’d purchased a DVD player with recording and burning capabilities, so I recorded around 75 film noir movies off TCM and burned them to disc; if I don’t already have it, I’ll check Amazon Marketplace and see if I can get it in decent used condition! You should be able to find it easily if you don’t have it already — I think even brand new it’s only $5 or $6 on Amazon! After checking, I discovered that I’d never recorded it off TCM, so I just ordered it from Amazon! Another fine addition to my collection! Great post, I alays find the opening when she is walking the streets saying David really eerie.